A visit last week to the stunning property of our client, Poderi Luigi Einaudi in the hills of the Dogliani region of Piedmont, took us on a dramatic tasting tour, with wine at the peak but two other regional flavors one finds in abundance at this time of year. Dogliani is the land of the Dolcetto grape (labeled “Dogliani” on the bottles of the best wines), and Einaudi is its top producer. The Poderi Einaudi estate is also the cradle of some terrific Barolo wines, made from the Nebbiolo grape. Here some of the juice that flows from the prestigious Cannubi hill and Bussia vineyard is vinified into ageworthy reds that provide a counterpoint to the more understated but elegant Dolcetto. The 2016 grape harvest finished a few weeks ago with early signs of a promising vintage. Locals drink Barolo to celebrate great occasions and after waiting years, but Dogliani to celebrate each day. On the food scene, there is a similar dichotomy between the prestigious and expensive and the merely delicious. This is the season for white truffles and hazelnuts. We attended the Alba White Truffle festival. A single white truffle, exported to the USA, can sell for hundreds of dollars. Truffles are enjoyed on top of pasta, pizza and nearly anything else this time of year – but in shavings. Piedmontese hazelnuts, on the other hand, are prized but appear in generous quantities, especially with breakfast pastries, aperitivo snacks and cakes. The holiday season is finally upon us. Bring on the fur-lined earmuffs, twinkle light draped trees, and Peppermint Mocha Lattes. And the food! Working in wine, food, and wellness, the food is our favorite part of the holidays. Last week, we gathered our Nonni family in my small Jersey City apartment for a cozy Friendsgiving featuring classic Thanksgiving dishes with a client-focused twist. Friendsgiving Golden Rule: Always ask for help. Cooking brings people together, builds closer relationships, promotes teamwork, and is simply fun. Cooking is an art, one I’m particularly fond of. To share that art with my coworkers and friends is something I am very thankful for this holiday season. 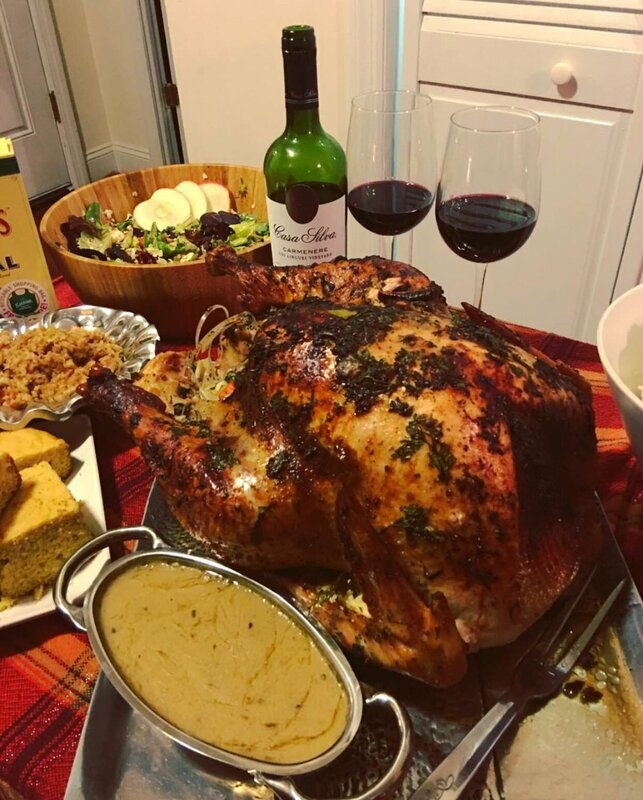 While I mashed the garlic potatoes, Jack basted the garlic herb encrusted turkey, Eunice simmered her from-scratch turkey gravy and sauteed the bacon fat brussels sprouts, and Erica provided the Chilean Carmenere and English sparkling wines. Honoring the English pilgrims of Thanksgiving, we toasted the evening with English Sparkling Wine from Ridgeview Estate. 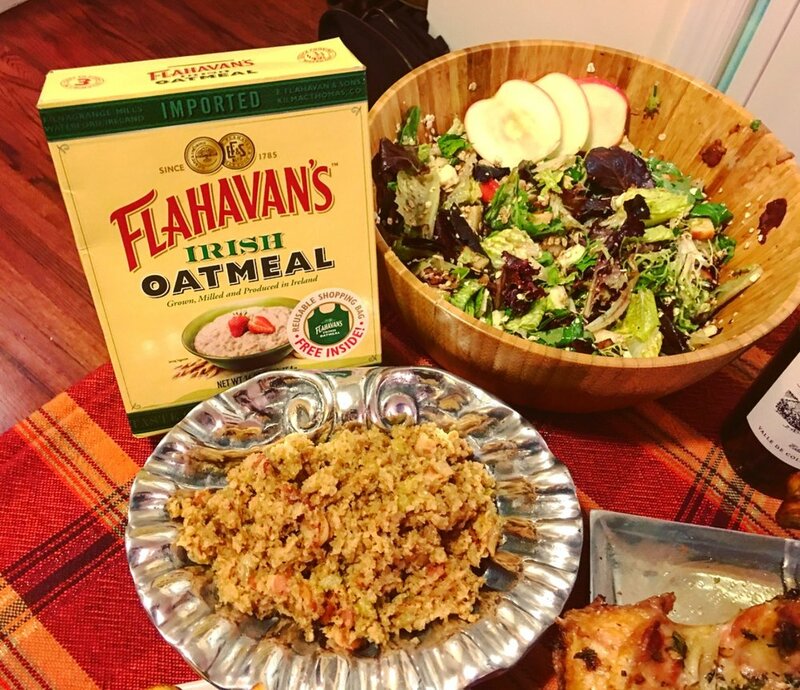 Swapping breadcrumbs for oats in the traditional stuffing, the Nonni team made “Skirlie” (Scottish stuffing) with toasted Flahavan’s Irish Oats, a healthy, protein packed, naturally gluten-free alternative. Experimenting with the diversity of oats, we added a dash of uncooked Flahavan’s Rolled Oats to a Shallot, Apple, Balsamic Boston Bibb Salad. Being wine lovers, we perfectly paired dinner with Chilean Carmenere, in honor of Carmenere Day (November 24), which coincidentally falls on the same day as Thanksgiving this year. Using crushed Nairn’s Stem and Ginger Grahams, we made a gluten-free, pumpkin pie with a flavor-rich graham pie crust. The food was out of this world, the wine was artfully paired, and the company was fantastic. This Thanksgiving, I am thankful for my Nonni family. Like the food shown above? Message us for a list of recipes featuring healthy substitutions, perfect for guests with dietary restrictions, this holiday season. The Colchagua Valley is one of Chile’s premier wine regions. Located between the Andes Mountains and the Pacific Ocean, Colchagua boasts a unique microclimate ideal for the production of Cabernet Sauvignon, Malbec, Syrah and Carménère grapes. Colchagua is an apropos region to illuminate, as November is Carménère Month. November 24th marks Carménère Day, which celebrates the enigmatic tale of this varietal once deemed lost to time. The tale of Carménère, like the region of Colchagua, is a fascinating blend of history and culture. Meaning “valley of small lakes” in the indigenous language, Colchagua marked the southern boundary of the Inca Empire. Winemaking did not exist in this ancient region until the arrival of the Spanish in the sixteenth century. In an attempt to convert the local people to Catholicism, Spanish Jesuit missionaries built monasteries and planted the first vineyards to accompany Catholic mass with red wine. During the nineteenth century, grape varietals from Bordeaux, France were introduced onto the shores of Chile. These varietals included Cabernet Sauvignon, Merlot and Carménère. However, the Chilean Carmenère was simply referred to as Merlot, and, as a result, “Merlot” thrived in this new region. Back in the Old World, a phylloxera epidemic was decimating countless vineyards, and the Carménère grape all but disappeared. Or so it seemed. Carménère has flourished in Chile ever since. A rose by another name, Carménère was re-discovered in 1994 by Jean Michel Boursiquot, a French ampelographer who identified the grape. Carmenère emerged from its ostensible disappearance. Today, Carménère is one of several varietals that can be found in Colchagua. With its Mediterranean climate ideal for growing grapes, the region has become a major tourist destination. Many of Colchagua’s wineries are modern, operating with wine tourism in mind. The Tinguiririca River flows through the region, where many popular wineries can be found. Visit this enchanting region’s many wineries. Taste the Carménère of the region and imbibe centuries of history. During Carménère Month, we celebrate the unique landscape of the Colchagua Valley and the superb grape varietals it has always, and continues, to produce. We're in Piedmont today and came upon this clever - and very literal - wine and food pairing: tortellini floating in red wine. It's like adult cereal.